RCodePad – a Russian text redactor, a program for people who wish (or can) write in Russian, despite their keyboard not having any Russian letters. Do not draw or paste anything onto your keyboard – it is simply unethical. RCodePad is the solution you have been looking for. - If an installation is not wanted or impossible ( the PC does not belong to you, you have no rights for installation, etc...) then use the second method: the self extracting archive RCodePad_Arhiv.exe. RCodePad - automatically recognizes some codes. 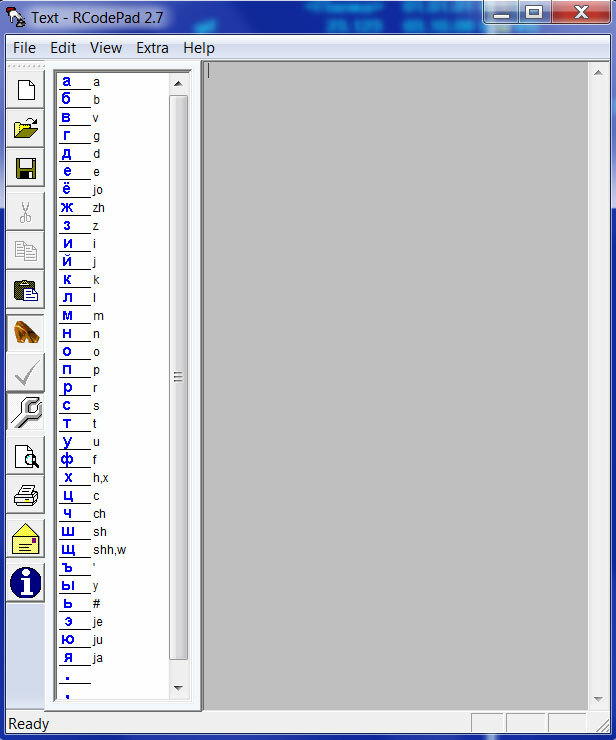 If you are unable to read a letter, an internet page or a text document ( it usually looks like rows of nonsensical letters, numbers and signs) then copy the text you have trouble with into the RCodePad window, or simply open it with the program and most likely you will be pleasantly surprised. RCodePad can write in both Russian and not Russian letters. Press the ESC button and feel the difference. The background colour changes and sound appears. If this gets on your nerves, simply change the settings back to normal in the settings menu. RCodePad - will allow you to assign up to three different key combinations to any given Russian letter. (Germans for example are used to using such combinations as “sch” while an Englander will use “sh”. Remember that keyboards from different countries differ a lot) To do that you have to write down your own combinations, using commas and no spaces and assign them across from the Russian letter in the left panel of the program window. The typed text is easily transported into other programs by using the usual operations of copy and paste. For more comfort (in case you use copy and paste often) you can turn on the automatic function of copying into the exchange buffer during the change to another program or window (Autoclip mode). You can convert the marked text into both, Latin -> Cyrillic and Cyrillic -> Latin. The interface languages : Russian, German and English. You can choose one of them in the program menu. - to rename (translate) Russian tags in MP3-files. These utilities have there's own worth and can be extremely useful when copying Russian audio and video files onto outside media (CD/DVD, ExternHDD, mp3 Player etc.). A little secret. Since the typed out text is often needed (at least for the author) in a non Unicode format, RCodePad has two hidden functions. The saving of a file, while holding down the Ctrl key, as well as copying into the exchange buffer while holding down the Alt key, (or simply Ctrl-Alt-C) are not done in Unicode.